I wrote this August 9, 1995, the day of his passing. 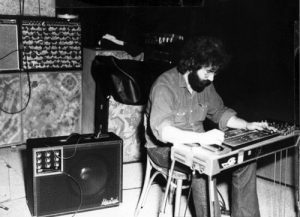 When I think of Garcia, I think of him unselfishly encouraging and inspiring others, his joy of creation and discovery, and his love of music. I am deeply saddened by his passing. For him: because he wasn’t really done this lifetime. For us: for the same reason. Before the Grateful Dead or even the Warlocks, Jerry and I were driving in his Corvair up from Palo Alto to Berkeley to see the Kentucky Colonels play. “Together Again” [Buck Owens] came on the radio, with that memorable solo by Tom Brumley. We both listened in reverent awe, and said, “Man, we gotta learn pedal steel.” Between the two of us, I was the first to get a steel and start playing, and that’s how I ended up playing on Aoxomoxoa. When Jerry came back from a tour with a brand new ZB Custom double-10 pedal steel, he absolutely immersed himself in the instrument. I remember going over to his house to see it. He had me playing guitar as soon as I walked in the door, and singing every song I knew, so he could boink around and play backups and solos. Later that day, I showed him some things that I had discovered on the steel, including parts of “Together Again.” He got good real fast and had a wonderfully unique style. About a year later he got another steel, and loaned me the ZB, because the pedal steel I had was quite a clunker. Mine had pedals like a 2-ton truck clutch, and knee levers to match. Using the ZB really helped me get a job with my first country band, and helped me get good. Later, after I added 3 more knee levers, and was playing regularly in a really good country band, I shared my enthusiasm over using the instrument with Jerry. He said, “Well, if you like it that much, I think you ought to keep it.” It’s a great sounding instrument, and 25 years later, still finds its way into the studio to the delight of recording artists and engineers. And me. So, today, shortly after I heard the news, I sat down at the ZB, played “Together Again,” and played the hell out of it. For Jerry. Thanks, man. I love you. I just now wrote this. I don’t want to give the impression that pedal steel was new to us on that trip to Berkeley. We were just reaffirming that pedal steel needed to be in our future. Jerry had already shown me pedal steel riffs on the banjo much earlier than that. Listen to the guitar solo on “Beat It On Down The Line” on the first Grateful Dead album. The first twelve bars are a pedal steel solo, they just happen to be on an electric guitar.